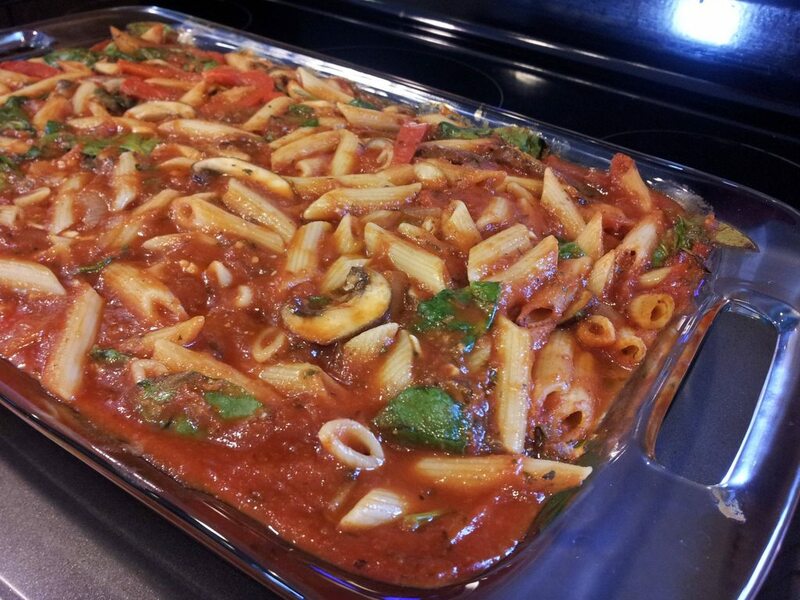 * Note : If you add any extra ingredient that would add to the bulk, you want to use a baking dish bigger than 9 x 13. I used a 9 x 13 and had absolutely no breathing room. Boil pasta as it says on the package. Drain and set aside. Cut mushrooms, pepper, garlic and onion and heat the oil in a large pan over medium-high heat. Put the chopped vegetables in the pot and cook util tender, around 5-7 minutes, stirring often being careful not to burn. Turn the heat off and stir in the spinach until well incorporated. When pasta and vegetables are cooked, put them in a large bowl (very large, use the biggest thing you have) and mix in the sauce and spices. Mix together all ingredients well and place into a 9 x 13 baking dish. Bake in the oven, uncovered, for 30- 45 minutes or until it’s firm on top, but not dry. If you wish to add vegan cheese, bake for 20 minutes, remove from oven, sprinkle cheese on top and place back in the oven for the remaining time, but keep a close eye.